British poet and filmmaker Tom Pickard was asked to write a libretto for an opera -- "The Ballad of Jamie Allan." The folk opera was commissioned by The Sage Gateshead and performed there, practically on top of the location of Jamie Allan's last crime. A gypsy whose career was notorious, beginning as a flamboyant lover and merry thief and ending in malice, jail, and death, Allan endured in Northumbrian histories, and even more so in the music of the pipes and fiddle, where tunes named for him recall his initial merry musicianship as well as the songs sung of his life of crime. Pickard went on to issue a book of poetry in late 2007, BALLAD OF JAMIE ALLAN, that become a finalist for the National Book Critics Circle Award in Poetry. It's not esoteric, or confessional; it can be read with pleasure and then fascination by even someone not familiar with issues of form and line; and yet it's a bundle of forms and approaches to both the gypsy and the ballad -- as well as many other shapes and notions of poetry. I spent a week enjoying it. so I followed the stream to search for a thief. by the sound of deep waters my lover was found. For an extra touch of wonder, check out the blog for the folk opera at http://balladofjamieallan.blogspot.com. Last night, poet Paula Gunn Allen died of lung cancer; her background includes many ethnic and geographic identities, but she has been best known as Laguna Pueblo, Sioux, and Lebanese. Born in 1939 in Cubero, New Mexico, her publications list is astonishing in its length and diversity. Most knew her as poet, novelist, and critic. In 2001 she received the Lifetime Achievement Award from the Native Writer's Circle of the Americas; in 2004 her POCAHONTAS was a Pulitzer Prize finalist; and in 2007 she won a Lannan Foundation Fellowship. Cold wind kicks up dust, smells of rain. Inevitably the mesas (aloof) call to me. It will rain again tonight. Then the clouds will be able to be still. Today's New York Times has a stunning review of Alan Furst's newest espionage novel, THE SPIES OF WARSAW. Calling the novel a "brooding, sophisticated period piece," reviewer Janet Maslin gives it unstinting praise, and says of Furst's work, "His stories combine keen deductive precision with much deeper, more turbulent and impassioned aspects of character. Since they are also soigné and seamy, there is the inevitable woman in the dining car, with whom --"
I halt here, because I haven't yet read the book, and want to follow Maslin's with my own response to it, later in June. Kingdom Books expects some signed copies to arrive here by the middle of the month (yes, we accept reservations). If you find me a bit hard to reach over the next week, it'll be because I'm re-reading Furst's other novels. Yesterday, here at the shop, one of our favorite collectors said to me, "I've decided Ted Allbeury goes into my top five for espionage." His other listed authors for the category are Deighton, Forsythe, Follett, Le Carré, and Ludlum. But mine at the moment are Furst and McCarry. Feel free to mention your own nominations, and reasoning. Dorothy Canfield Fisher (photo at left) is a name that, for Vermonters, calls forth another century, as well as this year's school projects: The Vermont author was a peace activist before and during World War I, and her children's books later brought her (and the state) so much attention that Vermont's "middle grades" book reading list and award each year are named for her (more commonly called "DCF"!). Her heritage also continues in the form of the League of Vermont Writers. Because the group is not specific to poetry or mysteries, I won't mention it often here -- but I've had several notices for its summer events and want to pass along this one, as the agencies involved are indeed interested in mysteries that New Englanders are writing. So ... The LWV's "Writers Meet Agents Conference" is scheduled for Sunday July 19 in Burlington and will feature representatives from Curtis Brown Agency (New York), Dystel & Goderich Literary Management (New York), Fairbank Literary Representation (Massachusetts), The Fischer-Harbage Agency (New York), The Nancy Love Literary Agency (New York), and Spectrum Literary Agency (New York). For more info on the event, keep an eye on the LWV's web site, www.leaguevtwriters.org. There will be one-on-one pitch sessions, rounddtable discussions, workshops, and more. In 1929, luminaries Dorothy Canfield Fisher and Helen Hartness Flanders helped establish what would become the League of Vermont Writers. In the 21st Century the League's membership includes such well-known names as Chris Bojahlian, Joe Citro, David Huddle, and Ellen Bryant Voight. Early speakers such as Frances Parkinson Keyes, Robert Frost, and Dorothy Thompson, were eminent figures in their day. These days our speakers include nationally known authors Archer Mayor, Tim Brookes, and Katherine Paterson. Continuity amid change is a hallmark of Vermont's oldest state-wide writers' organization. While the League continues to adapt to changes in the publishing industry and advances in technology, as Karen Lorentz wrote in her history of the League's first 75 years, "one thing has remained steady — the desire to promote education and networking among members so as to inspire writing and expand opportunities for publication." The League of Vermont Writers invites you to join an organization that has been working with and for writers in the Green Mountain State for nearly 80 years. One of the enigmas of poetry is that it takes enormous effort to pare down the line into essentials. Charles Simic and Ted Kooser offer vastly different examples of what can result. Newly available, thanks to our "global" existence, is the work of Polish poet Tadeusz Rózewicz (there should be a dot over the first Z but my keyboard doesn't have that option, sorry). Bill Johnston's translation of Rózewicz's NEW POEMS is a quiet best-seller, and was a finalist for the National Book Critics Circle award in poetry. For an enthusiastic biography of this post-war poet, try http://www.culture.pl/en/culture/artykuly/os_rozewicz_tadeusz; he served in the resistance as a teen in World War II, suffered the death of his brother at the hands of the Gestapo, and has published more than 20 collections of poetry. He's also noted as a playwright. Johnston's translation of NEW POEMS is available through Archipelago Books, in a solid, chunky, 258-page book in soft blue wraps (a bit too soft in texture, as the edges wear rapidly). The pages are well formatted to present the quiet short lines. Three of Rózewicz's books -- the professor's knife, gray zone, and exit -- are comined in this volume. Rózewicz challenges art, ideas, and "neutrality" in the balance of the piece. Johnston's translation feels as deft as a good actor's portrayal of character on stage, and the flow and interruptions of these poems taste of fine language, clean without being barren, lush without being flowery. Here is one other taste from later in the collection; how can one read this scrap without wanting to have the entire volume in one's hand, at one's side, on one's table? Lorraine Hanaway is a former President of JASNA who lives in Hew Hampshire; Mildred Darrow is a JASNA Life Member of our own VT Chapter: they were both there at the beginning of JASNA and will share some of thttp://www.blogger.com/img/gl.link.gifheir memories. Light refreshments served. September 14: A Talk by John Turner on Austen’s England (place TBA). Burlington Country Dancers (at Champlain College). 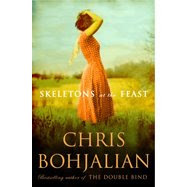 Chris Bohjalian's newest novel, SKELETONS AT THE FEAST, doesn't have a thing to do with Vermont -- except that the book began with a carefully preserved World War II era diary that had been handed down in the family of one of his Vermont neighbors. Addressing the finale of the war from an unexpected viewpoint, that of a young woman in an upper middle class family, forced to flee during the Russian advance on her home, it's a great summer read. Meet Chris and dig into the background at his reading at the Norwich Bookstore on Wed. May 27 at 7 p.m. (reservations recommended). Bookstore contact info: http://norwichbookstore.com and 802-649-1114. Poet Jay Wright was born in Alburquerque, New Mexico, in 1934. After a set of careers and studies ranging from professional baseball to theology, he developed a body of potent and elegant poetry. In 2005 he became the first African American to win Yale University's Bollingen Prize. to my dance under sorrow's tree. This swift darkness is spring's first hour. Denise Mina, SLIP OF THE KNIFE. Dark, often violent, immaculately plotted, with the tang of an acrid Glasgow (Scotland) fog -- Mina's work continues to be at the top of the field. Her signature here is dated 31st March '08. David Michie, CONFLICT OF INTEREST. We've got the British edition of this intense thriller, complete with the red promotional band. A gem of a copy. Michie lives in both London and Australia and has signed this. Alexander McCall Smith, THE MIRACLE AT SPEEDY MOTORS. Warm, reassuring, a satisfying "cozy" featuring Mma Ramotswe and her estimable husband, Mr. J.L.B. Matekoni -- signed neatly by the Scottish author and dated. So -- there's another reply to the folks who worry that the Internet and electronics are spoiling the field of book collecting. Not at all! Ten years ago, we would have sweated bricks to get signatures like these. Now we expect them each month. Some changes are definitely for the best. Arthur W. (William) Upfield was born in England, and first came to Australia at age 20; it was a moment in his life when he was ready to adopt this complex land for his own, and although he returned briefly to England, he soon brought his wife and growing family to the land of kangaroos and the Outback. His mystery novels fastened squarely on the racial prejudices he saw around him, enacted through a "half-caste" (half White, half Aborigine) detective inspector that he named Napoleon Bonaparte. The mystery series is often called the Bony books -- and Bony is used as a nickname in the stories -- but some versions of Upfield's life say that was a typing error by the publisher, and the author's original version had been Boney. This spelling reemerged when the books began to be turned into films. Upfield's handling of the stresses and strengths of D.-I. Bonaparte reflect what might now be regarded as racial essentialism: He presumed that the Aboriginal "half" of Bony would be fierce and inclined to inflict death when enraged, and the white "half" would be civilized. Upfield's principal violation of this assumption, and a fascinating one, is his construction of the character as drawing his intelligence from both sides of his genetic inheritance, as well as from the odd circumstances of his upbringing. Note that many of the books had multiple titles. Among them, THE BONE IS POINTED is often a readers' favorite; I am currently enjoing THE BATTLING PROPHET. Upfield's books are increasingly harder to find in early editions, and the hardcovers are scarce; sometimes the softcovers are nearly as collectible. A solid reference on the author and books is THE SPIRIT OF AUSTRALIA: THE CRIME FICTION OF ARTHUR W. UPFIELD, by Ray B. Browne (Bowling Green State University Popular Press, 1988). Browne's detailed analysis of the work delves into Upfield's exploration of the half-castes and of the independent men who labored to eke out a living in the Outback; it also gives details of the individual books. It's becoming almost as hard to obtain as the Bony books themselves. Although the language in the books is now dated (definitely 19th century in its structure), the plots are generally well done in the British style, and the insights into Upfield's perception of the bush and its inhabitants are compelling, quirky, and an added plus to the series. Craftsbury Common, VT – For a week each June for more than twenty years, people from around the country have come to Sterling College as participants of the Wildbranch Writing Workshop. The workshop, co-sponsored by Orion Magazine, targets writers interested in outdoor, natural history, and environmental writing, as well as environmental educators and activists who want to bring better writing to their work. On Wednesday, June 4, at 7:00 pm, in Simpson Hall, Wildbranch faculty will present an evening of readings from their own works. These faculty include: David Abram, Janisse Ray, Scott Russell Sanders and Sandra Steingraber. The readings are free and open to the public. Biologist, poet, and environmental writer SANDRA STEINGRABER is the author of Living Downstream: An Ecologist Looks at Cancer and the Environment, Having Faith: An Ecologist's Journey to Motherhood, and Post-Diagnosis, a volume of poetry. Steingraber's investigative writing has received recognition from the Jenifer Altman Foundation, Ms. Magazine, the American Medical Writers Association, and Rachel Carson's alma mater Chatham College, which, in 2001, selected Steingraber to receive its biennial Rachel Carson Leadership Award. Holding a Ph.D. in biological sciences and a master's degree in creative writing, she is currently a Distinguished Visiting Scholar at Ithaca College and serves as a contributing editor at Orion. Cultural ecologist, writer, and philosopher, DAVID ABRAM is also an accomplished storyteller and sleight-of-hand magician. He is the author of The Spell of the Sensuous: Perception and Language in a More-than-Human World, for which he received the Lannan Literary Award for Nonfiction. His essays on the cultural causes and consequences of ecological disarray have appeared in such journals as Orion, Parabola, Environmental Ethics, and The Ecologist as well as in numerous anthologies. The father of two small children, David lives at the edge of the Sangre de Cristo mountains in northern New Mexico. JANISSE RAY is a writer, naturalist, and activist. She is the award- winning author of three books of creative nonfiction—Ecology of a Cracker Childhood, Wild Card Quilt: Taking a Chance on Home, and Pinhook: Finding Wholeness in a Fragmented Land—and the editor of three others. More than personal narratives, her books are commentary on social and ecological life and calls to action. Her essays, poetry, and fiction have appeared in numerous periodicals and anthologies. 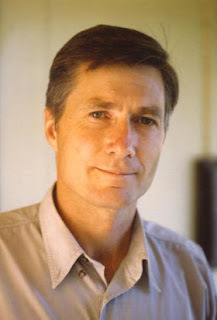 SCOTT RUSSELL SANDERS is the author of nineteen books, including Staying Put, Hunting for Hope, and A Private History of Awe. Winner of the Lannan Literary Award and the John Burroughs Essay Award, he has received fellowships from the Guggenheim Foundation and the National Endowment for the Arts. Since 1971 he has taught at Indiana University and has lived in the watershed of the White River in the hardwood hills of southern Indiana. H. EMERSON BLAKE was trained as an ecologist, and his first editorial job was with a biology journal. After a decade as an editor at Orion, he assumed the role of editor-in-chief at Milkweed Editions, a book publisher. In 2005 he returned to Orion to serve as the magazine's editor-in-chief and as the executive director of The Orion Society. He is the editor of hundreds of magazine articles, as well as many books of fiction, nonfiction, poetry, and children's fiction. JENNIFER SAHN is editor of Orion magazine. Articles she has edited have won John Burroughs Essay Awards, Pushcart Prizes, and have been reprinted in the Best American Science and Nature Writing and Best Creative Nonfiction. She has been on the editorial staff of Orion for the past fifteen years, during which time she also worked closely with the education and outreach programs of The Orion Society. Her writing has been published in a variety of print venues and she has served as the editor for several book projects. For more information on the Evening of Readings, please contact Sterling College at 802-586-7711, ext 159. A poetry publisher who'll remain nameless e-mailed here last week and wondered what the world would be like without printed books. The blog and the web site continue to expand as forms of delight for communication, raising such concern. What many of us endless readers say is that we can't imagine taking an electronic machine to bed with us, much less to the beach, or the dentist's waiting room. Yet Amazon's Kindle warns us that in this case, it's our imagination that may be hesitant, and the future is racing toward us. Nonetheless, books retain a physical form that's pleasing in the hand (at least, if one's grown up reading them that way! ), and it's a sure bet that even as reading for information or pleasure spreads across multiple forms, books-with-pages will continue to exist for generations. One more excursion before getting to the point: I also had word this week, via both e-mail and paper correspondence, of the continued regret, even grief, over the demise of our nearby neighbor in the book arts, The Stinehour Press. One baffled mourner said to me, "How could this happen? The Press has made such beautiful books!" Well, beauty on the page is not a requirement for information-handling. But the elegance and paper-laid presence of metal and wood type won't be lost -- they will remain as tools and skills of artists of the book. ... an anonymous collective that will publish one chapbook a year, created like a limited-edition piece of art, and distribute it free to subscribers. We are very excited about our first little book -- new translations of Lorca poems with drawings by yours truly [bluehour1]. We encourage people to follow our progress as we work on our project. The number of copies will be limited- the number of books and our time~frame for all of this is still being hashed out. But a start, no matter how humble, is still a start :)! The site for following the creation of this artful book is www.bluehourcollective.blogspot.com, and it's well worth regular visits. E-mailed conversation with "bluehour1" resulted in an item on the Blue Hour Collective blog about Federico García Lorca's stay in Vermont, a curious detail in the life of the flamboyant poet. Also posted this week is a draft cover design for the chapbook-in-process. Thanks, Blue Hour folks, for generously providing this window into your work! In a meticulously crafted set of poems at the Vermont Studio Center this evening, Fanny Howe showed how important it can be to hear a poet -- that is, sit close by, and listen to the lines in the voice of the person who wrote them. I suspect reading Howe's work aloud in a room alone, or listening to a friend read them aloud, might have similar power. The point is literally to hear the way the words slide against each other. Although Howe spoke of "the subliminal desire for narrative underlying much work that I feel is fragmented on the surface -- it's crying to be let loose," the threads of narrative in her work can be interrupted, stitches that rise through the fabric, then vanish under the fabric to knot or writhe beneath it before rising again. To have one voice and one face express them holds them close together longer, I think. Howe opened her reading with a reflection affected by location: "What we really want is to return to an agricultural, cyclical world and us in it ... that our purpose is physical and real, and not what we imagine it to be. You get that from being in a place like this while the trees are in bloom." Some of the others believe in food & drink & perfume. the One that moves around each form. Wind, breath, spirit: The Irish storyteller, the translator of Holocaust poetry, the Boston-raised rebel, the whole-hearted mother and grandmother. Howe brings it all together, and the spaces of silence or disconnection among her lines allow echoes and reflections from one to another. This evening she soon segued into her newest collection, THE LYRICS, from which she chose a poem that honored Robert Creeley (long a voice of the Vermont Studio Center). She noted her reversion to series of poems that "have as their beginning and end either an emotion or a place I've been." This, she said, corresponded with an Arab concept of a "day" being the period from the beginning to the end of an experience. Rhyme, especially internally, peeked through in bright moments. Meter became clear in Howe's voicing. Her use of repetition emphasized the question/answer patterns within the poems. Equally, the lines become the call and response of liturgy. Howe concluded her reading with a poem from THE LYRICS that she wrote when leaving the Benedictine monastery where she goes often to stay in Ireland; we sold all our copies of the book this evening, so I am without line breaks but offer here what I heard: "but a guest must leave her host / in order to remain a guest" and at the final section of the poem, "no sons / no daughters / no poets / no more house." With a kind smile, she closed the book and declined a request to "read another" -- allowing a form of silence to wrap around the set of poems and reassert its position as the object of desire for The Lyric. I've come to this collection a bit late, and there's a raft of reviews already out there: They wrangle over what Rich represents and what she has become in this collection. Some sputter over the handful of notes at the back, and the need to know the war news that Rich alludes to in the poems. Others assert she's lost her feminist stance, by taking a political one that assails the Iraq war and occupation without specifically claiming a woman's perspective on the disaster. Reading a dozen essays on the book gave me the notion that read established poets with a mirror in one hand, looking for similarities. Perhaps it's easier to directly experience the words when the poet is less painted into our own interiors. Rich, now 80, spoke on April 28 at her alma mater, Radcliffe. The article provided by the college (here) recaps the poet's awards, including the one she declined in 1997 because of her profound abhorrence for the actions of the nation's politics and its Administration. It outlines her continued tie to Radcliffe through poet Elizabeth Alexander, and gives honor to the Radcliffe poet/professor who mentored Rich, F. O. Matthiessen (1902-1950). Please do read the article, in full. This is fresh language with a fierce edge -- and in fact, the one thing the reviewers agree on is that Rich is not writing "like an old lady" but like a powerful poet. Even when "Ever, Again" calls up at a summer spent in Vermont when her sons were boys, the crisp images and sensory overload have nothing to do with nostalgia. Most of all, these two years of poems frame protest against the war, and The War: every one that Rich has witnessed. That includes America's disastrous failures in the war on poverty, too, as displayed after Hurricane Katrina (the poem is "The University Reopens as the Floods Recede"). the particle fierce and furthering. [Chestnut Hill, MA, May, 2008] Pine Manor College announces its annual Solstice Summer Writers’ Conference Reading Series. All readings begin at 7:00 p.m. unless *otherwise noted, and are held in the Founder’s Room of Pine Manor College, located at 400 Heath Street in Chestnut Hill. Copies of the authors’ books will be available for sale after all readings; cash-bar receptions will follow the readings on June 22, 27, & 28. *Plenty of free parking! Francisco Aragón (author of Puerta del Sol; editor of The Wind Shifts: New Latino Poetry) & Julia Glass (author of The Whole World Over and 2002 National Book Award winner Three Junes). Cleopatra Mathis (author of White Sea and What to Tip the Boatman? winner of the 2001 Jane Kenyon Award) & Tor Seidler (author of the forthcoming Gully’s Travels; Publisher’s Weekly Pick of the List The Wainscott Weasel; and Mean Margaret). Director Meg Kearney (author of An Unkindness of Ravens and The Secret of Me) & Steven Huff (author of the forthcoming A Pig in Paris and More Daring Escapes). Patricia Spears Jones (author of Femme du Monde and The Weather That Kills), Lee Hope (Pushcart Prize-nominee and winner of the Theodore Goodman Award for Fiction), & Eric Gansworth (author of Indian Summers and Mending Skins, winner of the 2006 PEN Oakland-Josephine Miles National Literary Award). Program Administrator Tanya Whiton (published in literary journals including Northwest Review and Crazyhorse 63) & Brenda Prescott (published in literary journals including Crab Orchard Review and The Louisville Review). Marina Budhos (author of The Professor of Light and House of Waiting; Rona Jaffe Award winner) & Stephen Dunn (author of fourteen collections of poetry, including Everything Else in the World and the Pulitzer Prize-winning Different Hours). Barbara Hurd (author of Walking the Wrack Line: On Tidal Shifts and What Remains and Entering the Stone: On Caves and Feeling Through the Dark, a Library Journal Best Natural History Book of the Year) & Dennis Lehane (author of the forthcoming The Given Day, Mystic River, Shutter Island, and Gone Baby, Gone). Directions to Pine Manor College, complete bios of our authors, and more information about the Solstice Summer Writers’ Conference can be found at www.pmc.edu/solstice. [press release] MACDOWELL COLONY POET, NATIONAL BOOK FINALIST TO READ AT BROOKS: Alicia Ostriker, a major American poet and critic, will read from her works on Thursday, May 15, at 7 PM, in the Main Reading room. Ms. Ostriker has published eleven volumes of poetry, including The Volcano Sequence and No Heaven. Her poetry has appeared in The New Yorker, American Poetry Review, The Atlantic, Paris Review, Yale Review, Ontario Review, The Nation, and many other journals and anthologies. Twice a National Book Award finalist, she has also received awards from the Guggenheim and Rockefeller Foundations, the Poetry Society of America, the San Francisco Poetry Center, and the Paterson Poetry Center, among others. Ostriker’s most recent book of poems is No Heaven, described as powerful…delicately balanced” in The Southern Review, and “deeply compelling” by Maxine Kumin. Ostriker lives in Princeton, NJ and teaches in the low-residency Poetry MFA Program of New England College. Location: Brooks Memorial Library Main Room; for more info call Jerry Carbone, 802-254-5290. 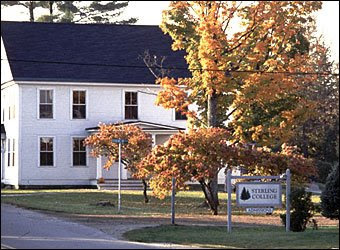 One of my favorite signs of summer is the announcement of the reading series at the New England College (Henniker, NH) MFA in Poetry program. Here is the schedule. I'll be there are least once, maybe more -- it's worth the gas to get there. All readings begin at 7:30 PM in the Great Room, Simon Center, 98 Bridge Street, Henniker, NH. Please call 428-2000 to confirm. The New England College reading series is free and open to the public. This evening, US Poet Laureate Charles Simic gives a lecture on poetry translation in Washington, DC: "The Difficult Art of Translation," it's titled. The lecture concludes his year as poet laureate, and unlike many of his predecessors, he's declined a second year, saying he wants to now spend more time writing poetry. Twists like this finale have given Simic a reputation for darkness and for being something of a curmudgeon, but in fact, poets who study with him often retain a loyalty and affection that has good basis in the careful attention that he offers to his students. And the tinkle of glasses in the kitchen. John Lescroart created a tough, dramatic crime series with attorney Dismas Hardy and police investigator Abe Glitsky, combining the best of police procedural with legal thriller. Three years ago, though, he stepped "off series," so the February 2008 release of BETRAYAL, promised as a Dismas-and-Abe return (number 12! ), made a huge splash. As a result, he's 75 percent done with the next book already, which opens in Iraq. The research (he's not actually going there) has involved people freshly returned, and Lescroart says it's been "pretty disturbing ... the people that come back are a lot more emotional than we realize or read about in the newspaper." Well, BETRAYAL is in fact deeply disturbing. For all the heroism and idealism that's been invested in enforcing a regime change in Iraq, Lescroart's novel suggests and equal amount of greed, meanness, and downright evil, thriving in the high-money stakes of controlling, occupying, and rebuilding the nation. The California team doesn't go out of the country. Instead, the betrayals and threats of a notorious set of psychopaths -- the kind that, unfortunately, get hired sometimes as mercenaries -- invade the professional and then private lives of Dismas and Abe. Even the FBI isn't on their side when things get tough. It's not unusual for a book well along in a successful series to change viewpoint and construction, and that's happened in BETRAYAL. Rather than narrate the twin lives of Dis and his law-enforcement colleague, as he had earlier, the new frame that Lescroart adopts is to write a military thriller and frame it with his series characters around the edges. A National Guard reservist and an ex-Navy SEAL wrestle for the attention of a beautiful -- and war-opposing -- teacher. Their competition flashes from a fire-war in Iraq to serial murder in California. And Dismas gets in the way, risking his family in the process. I found the plot intense and tight, the level of threat pounding and insistent, the Iraq sequences and exploration of traumatic brain injury compelling. Moreover, I found myself thinking more about the superstructure of a series, and wondering where Lescroart's hunger for character-driven plot will take him next. When the Frost Place opens for the season at Memorial Day weekend, two weekends away, my calendar turns heavily to poetry. Sure, it's my turn on the board, so that first weekend, I'll probably be at the house where Frost lived while he wrote his most noted poems ... except I'll be sweeping, raking, fetching trash bags, whatever the site stewardship team needs. Although I hope to take a few minutes to sit on that inspiring front porch and overlook the mountains in Franconia Notch, I won't be writing poetry just then -- or even reading it. But the poetry unfolds from there. Here's the action-crammed schedule of free public poetry readings that executive director Jim Schley has planned, with an amazing group of top contemporary poets. I'll try to post reminders on the blog now and then, with some samples of their poetry. And when do I write my own? Usually after one of these readings. They're so provocative that it makes my fingers itch to shape my own lines and stanzas. I figure it's a lot like going to church or synagogue: I disagree at least half the time with the sermon, which pushes me to realizing and putting into words what I really do believe. In the same way, once the elation of listening to strong poets mellows to plain ordinary joy, I find I want to get my own style working again on paper. So in case you have the same pattern -- or just like to know what's hot in the poetry evenings coming up -- here's that list of dates. Hope to see you on the hill at The Frost Place this summer. One of the newest arrivals at Kingdom Books is a fantastic reference on Arthur Upfield and his Napoleon Bonaparte ("Bony") mysteries, and I'm working my way toward discussing all of that -- but first let me step into the field of Australian writing through a current author, Garry Disher. Disher's books are so highly valued in the US among the few who know them, that it's been a challenge for us to get a good set of them. But as soon as we pulled together a well-stocked shelf, a collector arrived and literally cleaned out all except one title. Heartbreak! (Browse our holdings by going to our web site, www.kingdombks.com, and use the Search function, which takes you directly into our ABE listings). Soho Crime has been a lifesaver in getting these into the US market. In Australia, Disher is referred to as a "novelist" rather than as a mystery or crime fiction writer. He's been known to refer to himself, though, as wearing three hats at once, for the three genres in which he's won acclaim: young adult fiction (especially the award-winning The Bamboo Flute), literary novels, and crime fiction. But he also says that for him there's no huge division among the forms of writing -- they are all equally part of him. Within the crime fiction area, Disher's work comes in two forms: the Wyatt series, which are thrillers, and the Hal Challis series of police procedurals. His work is strongly rooted in the northern region of South Australia (that's a province there), where his family has lived for generations. Is McQuarrie simply waiting to be told the worst? wondered Challis, or does he know something that we don't? 'Whatever it is, we'll find it,' Challis said. You had to say things like that to your boss and a fearful public. He meant it, but he was saying it to shut McQuarrie up. Anxious to get going, he finished the conversation and returned to his office in CIU and a backlog of paperwork that owed plenty to the superintendent's cost-cutting measures. The budget destroys resources, Challis thought, the paperwork destroys time, and the jargon destroys reason. SNAPSHOT maintained a jagged, relentless tension throughout, although I didn't feel any urge to make sure the doors and windows were locked, or to turn on more lights. Instead, I wanted, very much indeed, to know how each of the investigators would sort out the life issues that were being jacked up into pain and threat through the kind of work they did, the hours, the tragedies. Well worth reading, and I'll be fitting another Disher novel into my reading schedule as soon as possible. Dave cautions that the Wyatt series has not been issued in the US; he's placing one Australian copy online tonight, and hopes to soon restock our shelf of the Challis series, though. 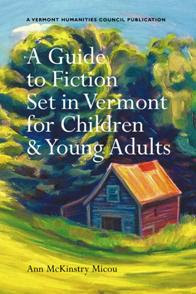 The Vermont Humanities Council just brought out its second comprehensive guidebook by Ann McKinstry Micou, A GUIDE TO FICTION SET IN VERMONT FOR CHILDREN & YOUNG ADULTS. It's a marvel of Micou's comprehensive gaze over the wide range of such books, from Rose Lucia (a Montpelier school principal who wrote "readers" set in East St. Johnsbury around 1910), to Katherine Paterson (award-winning author of BRIDGE TO TERABITHIA and many other beloved books, several of which are indeed set here), to Robert Newton Peck's classic A DAY NO PIGS WOULD DIE. Particularly enchanting is the way the book can be read and plumbed from so many directions: from the initial listing by age of audience (first picturebooks and easy readers, then children's and young adult fiction); or by genre (science fiction or historical fiction or humorous or realistic or romance); by author name; by year of publication; even by "real location" (a great way to find fiction that's set near a child's own home). And collectors will appreciate the listings by award, too. Micou's most scarce gift is her masaterfully honed ability to give a single long paragraph for each book, revealing plot and characters, rich with colorful detail, and narrated so well that reading through these summaries is almost as enjoyable as reading -- well, fiction! The book also spins an enchantment in its positioning of authors: The picturebooks section, for instance, begins with Jim Arnosky, Jay Avery, and Mary Azarian; if you've raised kids in Vermont (as I have), just the names tripping from the tongue bring back hours of fun and exploration and thoughtful pondering with children. I did find a couple of items that raised questions in the Bibliography near the end, where author details are quickly brushed in. There are also some authors missing who have places of honor on my shelves (some of which just may not fit Micou's final criteria for inclusion). However, these are small flaws in such a comprehensive resource, and knowing already the kind of writer and reviser that Micou is, I expect she'll welcome any corrections and of course additions in the second edition, as she is already doing for her first volume from the Humanities Council, A GUIDE TO FICTION SET IN VERMONT. And the best, most wondrous aspect of this two-volume set is exactly what Humanities Council executive director Peter Gilbert says in his Preface: "Both books encourage reading and life-long learning, and, by encouraging pride and connectedness with one's community and state, they also promote civic engagement." In other words, there are so many books, so little time -- and Micou's guides to fiction set in Vermont provide the tools for choosing among them, broadening one's choices, and appreciating the riches she describes. Galway Kinnell delighted the Northeast Kingdom poetry fanatics this evening by bringing to Vermont his friend John F. Deane, noted Irish poet and collaborator on behalf of the abolition of war. Deane gave an hour-long reading at the St. Johnsbury Athenaeum, with the wild wonder of Bierstadt's "Domes of Yosemite" rising behind him out of the darkness. Raised as a "militant Roman Catholic," Deane often shapes his poems around elements of the Mass, as well as its great works of music. I picked up a copy of his 2003 volume MANHANDLING THE DEITY, which opens each section with an Officium and braids into the sequence a "Processional," "Magdalene," even "Recessional" and "Canticle" (one of Deane's few happy poems, he confessed -- saying that in a nation of endless rain, he writes a happy piece about once in 14 years). sails, the tide brimming, then falling away. Deane writes fiction and essays as well as his poems, and is a leader in Irish and European poetry organizations. His web site is well worth exploring: www.johnfdeane.com. Here's a quick recommendation for a book that David R. Godine brought out in 2007 but that I've just caught up with: TOAD TO A NIGHTINGALE by brothers Brad (the poet) and Mark (the artist) Leithauser. Its tongue-in-cheek poems, strongly rhymed, are accompanied by amphibians, flowers, birds, fruits, all in the warm personal style of the pen-and-inks that accompanied the children's books of a hundred years ago (Wind in the Willows, for instance). Give it to a boy or girl who can't stop drawing; see what the kids make of it. My guess is, they'll hunger to craft their own versions -- and may even begin to draft poems to go along with the images. David R. Godine now uses the imprint for Black Sparrow (www.blacksparrowbooks.com), with a poetry publishing corner that's somehow snugged up against the rest of his gorgeous books. Reliably well designed, with elegant pages and sturdy bindings, Godine's creations are a good sequel to John Martin's West Coast line. Bamber's urban existence is occasionally punctuated by trips into the countryside, like the one with a woman friend that becomes a poem in memory of Grace, presumably Paley, and a poignant clinging to friendship: "The best writer living in America today," Bamber reports, "may well be a woman; but she won't be that / much longer, because, you told me then, / she's dying." Summer meadows are backed by winter cities; warm friendship by chilling death. Long views can be distressing, short ones sweet and even amorous. and was always reading something choice. for something to stay conscious for. In fact, Godine's web site offers a shared compliment to O'Hara and Banber at once, from Tony Hoagland, who read the book in manuscript and continues to delight in it: "As a reader I have often wished, over the years, for a female poet in the style of [Frank] O'Hara: bopping but sincere, humanistic and grounded but exuberant and irreverent. 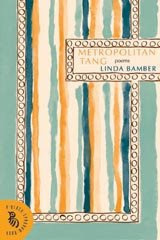 Linda Bamber may be that person," he wrote. I like in particular Bamber's swan dives into that sea of literature, splashy and bright: "Ulysses came home, and things got better," is the opening for her "Penelope." And she darts among ordinary moments of teaching, making love, and answering the phone, taking each one observantly and with gusts of laughter, sweeps of pleasure, dollops of irritation and realization. Is she today's Frank O'Hara? Hmm. Worth reading again, thinking about that -- or not thinking about it at all, just enjoying this bright fresh collection. Thanks, DRG. Last night the Mystery Writers of America announced the 2008 book awards, and John Hart took "Best Novel" for his dark Southern crime novel, DOWN RIVER. Hurrah! Kate Mattes of Kate's Mystery Books in Cambridge, MA, one of our favorite shops, received her Raven award, Bill Pronzini became a GrandMaster, and Harlan Coben took over as new president of the MWA. For a complete list of award winners, click here. If you keep track of the poets coming to the Vermont Studio Center in Johnson, Vermont, you already know the center's schedule is subject to change. Gary Clark, director of the writing programs, just announced that Fanny Howe's open-to-the-public reading schedule has change and will be on Friday May 16 at 8 p.m. in the Lecture Hall on Route 15. I plan to be there for this often provocative California poet with strong Boston Irish roots. Fanny Howe was born in Buffalo, New York, in 1940. She is the author of more than twenty books of poetry and prose. Her recent collections of poetry include On the Ground (Graywolf, 2004), Gone (2003), Selected Poems (2000), Forged (1999), Q (1998), One Crossed Out (1997), O'Clock (1995), and The End (1992). Howe was the recipient of the 2001 Lenore Marshall Poetry Prize for her Selected Poems. For some lively insight into Howe's work and personality, check out Justin Taylor's correspondence interview with her.